Ian Williams and his GAC Pindar team claimed the M32 European Series warm-up event in Sanremo with a race to spare. The British six time Match Racing World Champion and defending M32 European Series champion and his crew of Richard Sydenham, Pete Nicholas and Will Alloway led from day one of this three day event. This was despite a late challenge from young Swede Nicklas Dackhammar, standing in as helmsman on Cape Crow Vikings for Aston Harald boss Håkan Svensson, which saw Dackhammar taking the fight to the British in the pre-start of Sunday’s first race. 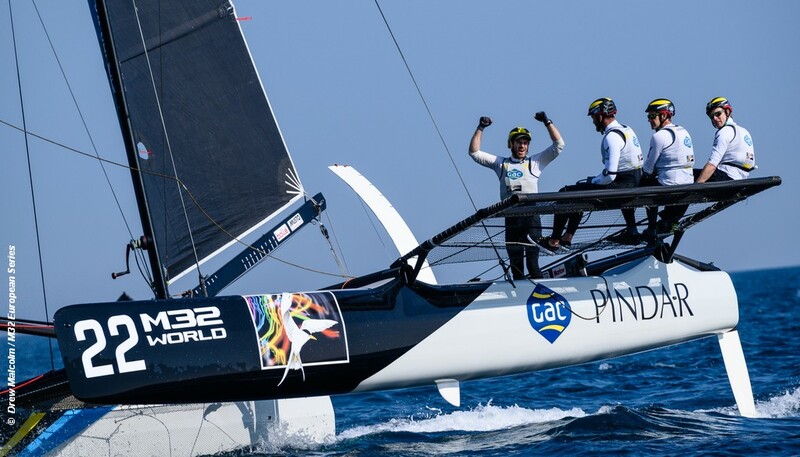 While GAC Pindar was again the winning boat of the day, second top scorer with a 2-3-3 was Youth Vikings Denmark, skippered by former Hobie 16 World Champion Daniel Bjørnholt. The M32 European Series begins properly in two months’ time, with the first of five scoring events taking place in Pisa, Italy over 24 to 26 May.